In this second section of the English translation of The Red Book, there are 21 short chapters with a brief prologue. Jung continues his dream/vision interpretations starting with “The Red One” which revolves around his personal devil. This is a vivid and highly detailed description and conversation containing an abundance of adjectives, adverbs and other descriptors. It seems that he uses the opportunity to make a point, although I am not sure I understand what that might be. 1. Did he embellish the dreams upon waking in order to make some additional point? 2. Were these more daydreams than night dreams, involving his thinking mind? 3. Were these efforts a purposeful vision-quest involving something like fasting? 4. Did Jung suffer from some chemical imbalance? 5. Was Jung experimenting with hallucinogenic drugs? It occurs to this reader that these are not entirely dreams, but are augmented in some way, perhaps involve his thinking mind. I am guessing that he is trying to intellectualize his own personal pain and suffering of generational angst through dream interpretation. In my opinion, he is searching for spiritual answers in the world of illusion and false reality. Instead of looking into his mind of emptiness, he is looking into his mind of learned religion and societal tradition. If that is not the case, then I have to conclude that he was either fasting, suffering from a chemical imbalance or was experimenting with hallucinogenic drugs. His musings remind me of discussions that I have had with people who have experimented with LSD or peyote. I am not saying that is the case here. For this reader, interest quickly wanes, as this is difficult reading. Jung seems to believe that rooting his musings on religious and societal traditions makes it all the more real. There is a section of “Incantations” using religious language as well as a set of “Prophecies”. You can only surmise this work somehow solved some underlying tension in Jung. How any of this may have helped him is a mystery. To this reader it is more like the party guest who repeatedly tells stories with no ending. As someone who has found grace and serenity within the emptiness of original spirit, I do not see how Jung’s approach will lead anywhere. He is attempting to rationalize illusion to find truth. I am not sure that this will result in his goal of resurrecting his soul. Perhaps it could make him more capable of practicing psychiatry, or operate within his religious or societal circles. But it is hard for this reader to imagine how he could have achieved any level of spirituality from this work. I will read on and report tomorrow on his next section “Scrutinies”. The notes of this little fellow (10”) are heard at great distance particularly because they occur at night in the late winter when things are otherwise quiet. This is their time of courting. It is a crisp whoooo. I absolutely love to call back and set off a whole chorus of answering sounds. A few years ago, late on a warming March day, I was taking a rest from some work I was doing on the first ridge. I was looking into the distance and noticed some movement on a dead maple tree that had broken about half way up. I picked up my binoculars and saw this magnificent bird looking back at me. I will never forget this sight. Here in Virginia we have an extraordinary number of field mice measured in numbers per 100 square feet by the state’s Natural Resource Department. 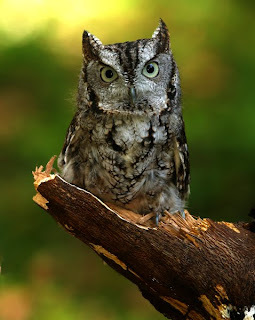 The Screech Owl is an important part of the nocturnal balance of field mouse ecology. According to Dancing Otters and Clever Coyotes by Gary Buffalo Horn Man and Sherry Firedancer, the Owl, also known as the Night Eagle serves as “messenger and guide from the shadowy realms of darkness.” With the Owl’s extraordinary sight and hearing it serves as a “harbinger of change”. This is from their intriguing and colorful book that has been reviewed with my own.